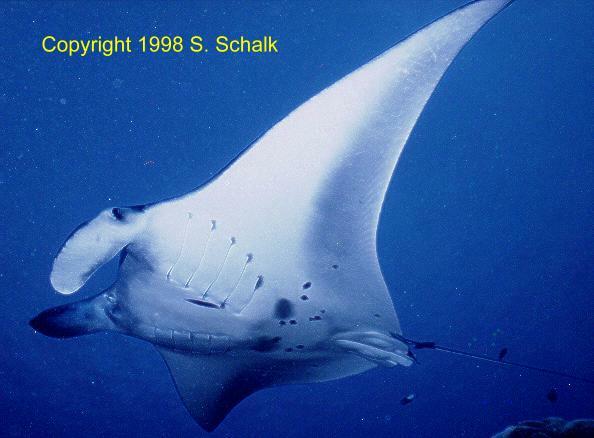 Due to proper water flow and high concentration of nutrients present during early spring, Mantas frequent Mi'l Channel, Yap, FSM in large numbers. As such, this would be where we would go to find them. From our accomodations at the Manta Ray Bay Hotel, our dive group of five traveled comfortably to Mi'l Channel on a 25', dual engine, open deck boat. Interestingly, to get to the channel, part of the travel was through a hand dug channel leading through the mangrove shoreline which was at some points barely 2' deep. Once at the dive site, we geared up and were dropped up current from areas the Mantas normally frequent. Although visibility in the channel is not as good as the open ocean, the drift dive down Mi'l channel is not boring! There are plenty of whitetip reef sharks, turtles, and large schools of fish to keep you interest peaked. To create the smoothest possible transition from the drift to stationary spots where we would be able to view the Mantas, we stayed at 60' for most of the drift portion of the dive. After approximately 20 minutes of extremely relaxing drifting, we were there. I knew this because I could see in the distance, a very large dark shape coming out of the cloudy water. Our divemaster also knew we were there and began positioning us where we would have the best vantage point to observe and photograph these beautiful creatures which now numbered four. The only rule we were to observe was not to touch. Prior to the dive, our guide explained that the Mantas could easily be spooked, and since we weren't the only divers there to enjoy their company, it was only fair not to risk scaring any of the Mantas away unnecessarily. The stationary spots afforded us the opportunity to let the Mantas come to us rather than fighting the 2-3 knot current and trying to keep up with them. It worked beautifully. Within minutes, I had more photographic subjects than I could keep up with. I was shooting 2 cameras, both Nikonos, one outfitted with a 15mm lens. I was glad I had a wide angle setup. Often times the Mantas get very close, and I needed every bit of the 94 degrees my lens afforded me to work with. At first, the urge to go out and swim with them was difficult to control, but once I realized there was plenty of time and plenty of Mantas it was easier to concentrate on composing photographs. A pattern quickly developed; the Mantas would circle around, pause for a minute, and swim off. Looking closely, I noticed there was a cleaning station at nearby at about 50', so I adjusted my position to take advantage of the photo opportunities that might present themselves. My decision to move paid off. One at a time, huge Mantas would glide in ever so slowly and pause just a couple of feet away with mouths and gills flared so the cleaner fish could do their job without interference. After a couple of minutes, they would move on and continue their racetrack pattern and another one would replace it. 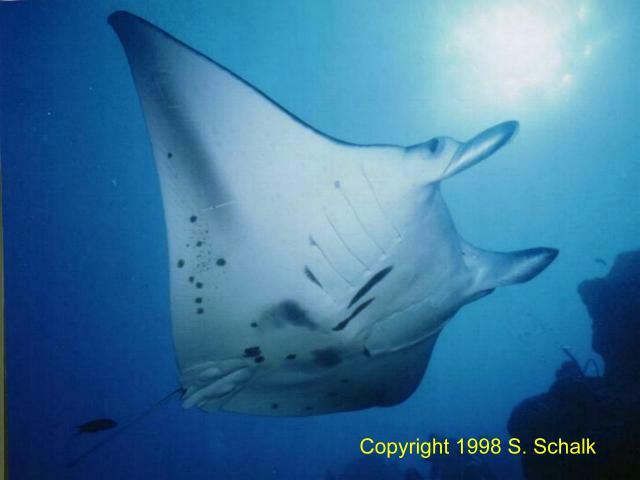 Since I still had some film left, I decided to try to get some shots of the bigger Mantas. With that in mind, I moved deeper towards the bottom of the channel. With the depth change came a drastic change in my remaining no-decompression time, so I knew I'd have to make this portion of my dive short. To reduce the chance I would spook them, I slid behind a large coral outcropping and waited for the big guys to swim by. This tactic worked; no sooner than I had settled in and a large "silverback" came cruising by. It kept getting closer and closer so I figured I take a chance. I dialed in CFWA settings and waited just a few more seconds until it was in range. Success! After a few more shots, my computers started screaming at me to move shallower or be ready to conduct decompression stops.